Everyone at SMU is united behind a single goal – help prepare our students to become the best they can be. Now, there are exciting news that aim to go a long way to achieve that goal, we are providing Office 365 to every one of our students for free. This automatically updatable, subscription-based software ensures our students always have the latest version of Word, Excel, PowerPoint, OneNote, and more for as long as they’re a student here and the program continues. According to an IDC study, students with Microsoft Office skills are better prepared for work in the professional world and we are pleased to help our students on their road to success. This offer is available to all students at SMU. 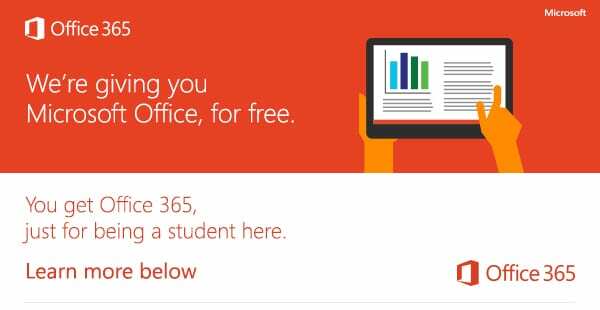 To get your free Office 365, visit Office.com/GetOffice365 and follow the download instructions. If you have any trouble, view our service page or contact the IT Help Desk for assistance.